Warner Bros. has released the first trailer and poster for their remake of the 1979 classic Going in Style, which is set for release on April 7, 2017. The original film starred comedy legends George Burns, Art Carney and Lee Strasberg as three senior citizens who decide to rob a bank. 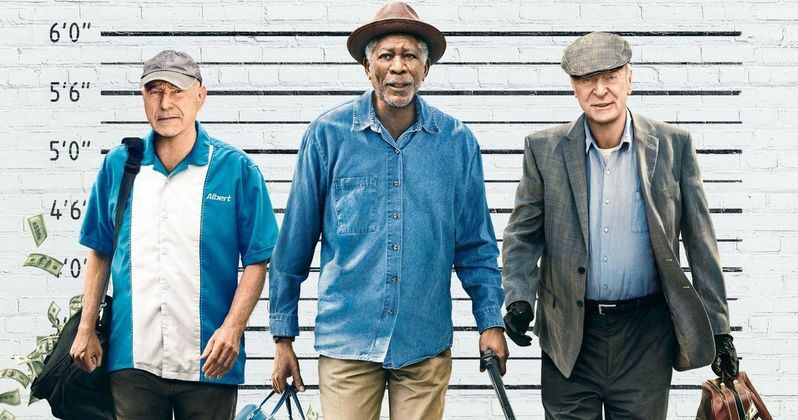 While this premise is still largely intact, the story has been updated for the 21st Century, with Morgan Freeman, Michael Caine and Alan Arkin starring in this comedy remake. Director Zach Braff will also be participating in live Twitter Q&A today starting at 9:30am PT/12:30pm ET. Fans can participate using the hashtag #IMDbAskZach. Oscar winners Morgan Freeman (Million Dollar Baby), Michael Caine (The Cider House Rules, Hannah and Her Sisters) and Alan Arkin (Little Miss Sunshine) team up as lifelong buddies Willie, Joe and Al, who decide to buck retirement and step off the straight-and-narrow for the first time in their lives when their pension fund becomes a corporate casualty, in director Zach Braff's comedy Going in Style. Desperate to pay the bills and come through for their loved ones, the three risk it all by embarking on a daring bid to knock off the very bank that absconded with their money. The film also stars two-time Oscar nominee Ann-Margret (Tommy, Carnal Knowledge) as Annie, a grocery cashier who's been checking Al out in more ways than one. Joey King (Wish I Was Here) stars as Joe's whip-smart granddaughter, Brooklyn; with Oscar nominee Matt Dillon (Crash) as FBI Agent Hamer; and Christopher Lloyd (Back to the Future trilogy) as the guys' lodge buddy, Milton. John Ortiz (Silver Linings Playbook) also stars as Jesus, a man of unspecified credentials who agrees to show the guys the ropes, and Peter Serafinowicz (Guardians of the Galaxy) as Joe's former son-in-law, Murphy, whose pot clinic connections may finally prove useful. Zach Braff (Garden State) directs from a screenplay by Theodore Melfi (St. Vincent). Going in Style is produced by Donald De Line (The Italian Job). The executive producers are Toby Emmerich, Samuel J. Brown, Michael Disco, Andrew Haas, Jonathan McCoy, Tony Bill, who was a producer on the 1979 film Going in Style, and Bruce Berman. Going in Style is scheduled for release on April 7, 2017, going up against Sony's Smurfs: The Lost Village, Lionsgate's Wonder, PureFlix's The Case For Christ and High Top Releasing's Sleight. The creative filmmaking team includes Emmy-nominated director of photography Rodney Charters (24); production designer Anne Ross (Lost in Translation); editor Myron Kerstein (Braff's Garden State and Wish I Was Here); costume designer Gary Jones (New Year's Eve); and composer Rob Simonsen (Foxcatcher, Wish I was Here). New Line Cinema presents, in association with Village Roadshow Pictures, a De Line Pictures Production, a Zach Braff Film: Going in Style. It will be distributed by Warner Bros. Pictures, a Warner Bros. Entertainment Company, and in select territories by Village Roadshow Pictures. Take a look at the first trailer and poster for Going in Style below, as we get closer to the April release date. Can Smurfs Knock Boss Baby Off the Top of the Box Office?